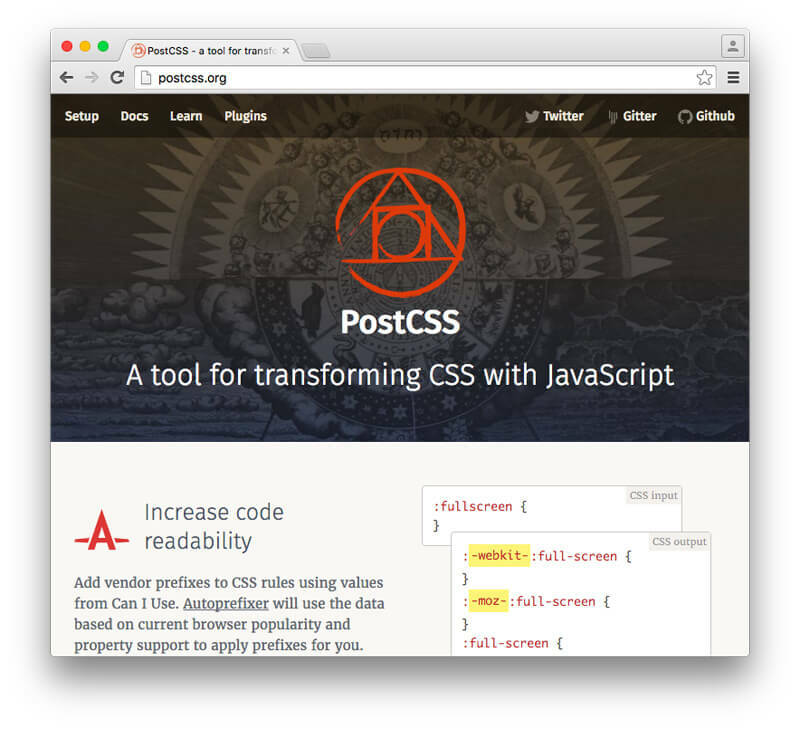 PostCSS has been gaining popularity rapidly for some time now. If you have not used it yet or don’t know what PostCSS is, then I suggest you take a look at this introductory PostCSS tutorial, which discusses the basics of PostCSS including how to install and run PostCSS with a quick overview of some plugins. In this tutorial, I will show you how to use PostCSS with Gulp, the popular automation tool. Since this is not an introductory Gulp tutorial I won’t be covering the basics of Gulp. But for a quick refresher, you can check out this excellent article. Before beginning this tutorial, you should have a project folder that you will work in. The folder should have Gulp installed and have two folders inside it with the names “initial” and “final” (or some other name of your choice). The folder called “initial” will have your raw and unprocessed CSS code. The “final” folder will have the processed files, ready to be used. The --save-dev flag adds the plugin that you are installing to the project.json file as a dependency. This will be helpful in situations where you need to collaborate with others on a project. When other team members run the npm install command on your package, all the plugins will be installed automatically. initial — The folder with your raw CSS files. style.css — Unprocessed stylesheet that we will edit later. final — The folder with processed CSS files. node_modules — The folder with all npm modules. gulp — Created when you installed Gulp. gulp-postcss — Created after running the command above. guplfile.js — Your Gulp file. package.json — Your package.json file. Let’s install a basic plugin to get started. The plugin we are going to use is short-color. This basically extends the existing color property to also set the background color using a second value. Run the following command to install short-color. I begin by creating a task called css. This name is to be used whenever you want to run the corresponding function. You can specify the files that you want to process inside gulp.src(). Using *.css will process all CSS files inside the “initial” folder. Next, we use the pipe() function to call all our plugins. To do so, we pass all the plugins as an argument to the postcss() function. In our basic example, we actually have just one plugin to pass. I’ll show you how to pass multiple plugins as arguments in the next section. After piping the plugin, gulp.dest() is used to set the destination of processed files. If the CSS in your stylesheet matches the CSS above, then we can assume everything is working. Just using one basic plugin is not going to help you much with productivity. PostCSS has a lot of impressive and incredibly useful plugins so in most cases you will be using more than just one. In this section I will show you how to work with multiple plugins at once. Three PostCSS plugins/packs that you might find useful are: short, cssnext and autoprefixer. You might have noticed that I have specified some options for the Autoprefixer plugin. These options determine the CSS that Autoprefixer outputs. In this case, I am telling the plugin to support all browsers with more than 1% of global usage. I have also disabled cascading so that all prefixed and unprefixed properties are left aligned. Similar options are also available for most other plugins. If you run gulp css in the terminal now, you should get the following processed CSS inside style.css in the “final” folder. The example in the last section illustrated the usefulness of PostCSS quite clearly. All of PostCSS’s power lies in its plugins. One thing to keep in mind, however, when using multiple plugins — which you eventually will in complex projects — is the order in which you execute them. As you can see, there is no RGBA fallback in the processed CSS. The reason for this anomaly is that when the fallback plugin runs, it finds the background to be color(orange a(90%)) and does not know what to do with it. Later, the color function plugin executes and creates an RGBA color value from the original color function. This time the color plugin first transforms the background color to an RGBA value and the fallback plugin later adds a hexadecimal fallback. In this tutorial I have covered the basics of using Gulp and PostCSS together. With the right combination of plugins and efficient use of Gulp, you can save many hours of development and avoid unnecessary headache. If you have any questions or suggestions for the techniques mention in this tutorial let me know in the comments!